What a delightful surprise! 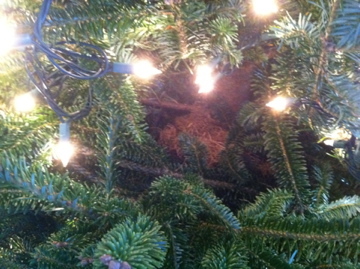 While putting up the Christmas tree at The Well Center this past week, we discovered an empty bird’s nest tucked inside the boughs of the tree! The nest is a simple, fragile creation made of scraps of grass woven together by a bird that needed a home and a safe place to give birth. This empty bird’s nest-perched amidst the community’s tree-is a wonderful invitation for all of us. Where are the places of refuge in our spiritual lives? How can we make spaces in our lives for new growth? How can we come together and become a nest for what wants to be born in us? In the Christian tradition, the period just before Christmas is known as Advent. It is a time for waiting in expectation for God to come and be born again and again and again. In the hustle and bustle of the season, take time to listen for and nurture the new life that is growing in you. Advent, darkness, and winter remind us of the importance of nestling in to wait in empty expectation for the new life that is growing. Be a nest.